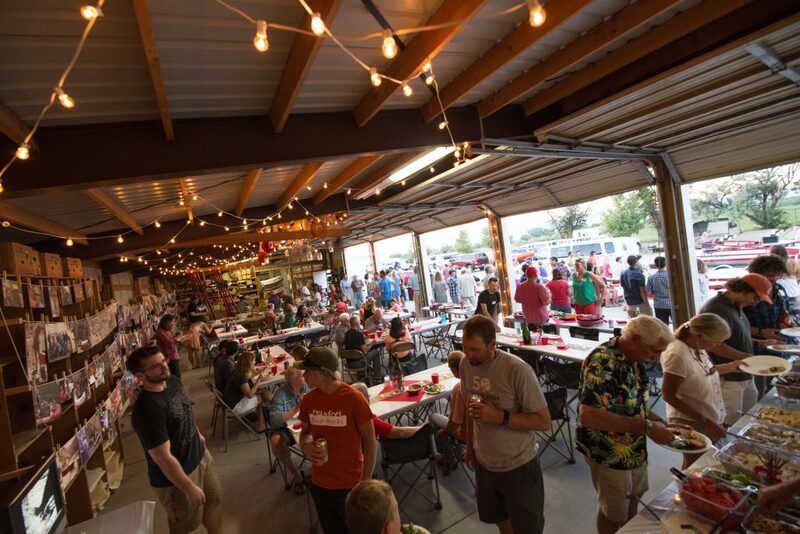 Ray’s Tavern was bustling with travelers, bikers and river-folk alike on the eve of the Holiday River 50th Anniversary weekend celebration. Like any other day at Ray’s, delicious smells wafted out of the brick building into the remote streets of Green River; acting like a homing beacon for river-guides far and wide. 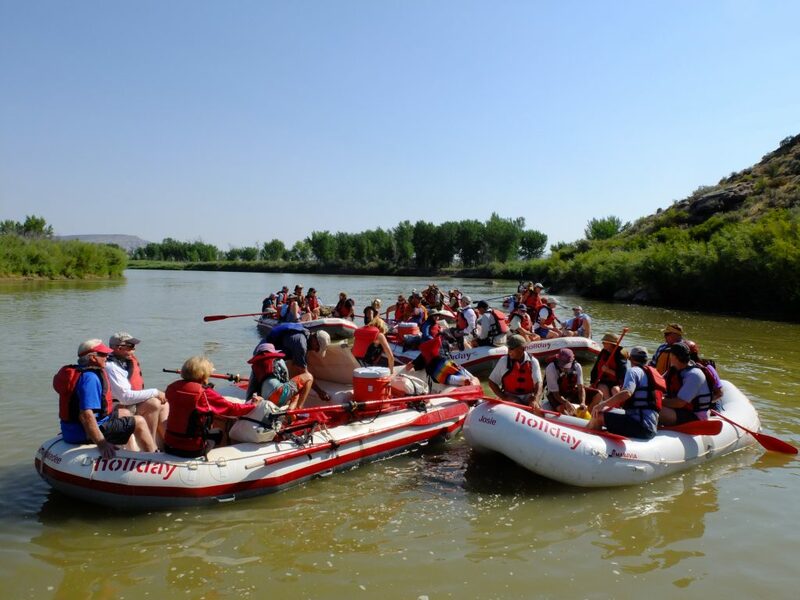 Younger guides and staff stepped into emergent roles, like the “Keg-tender” or “Van-driver” taking their turn to facilitate an unforgettable weekend for the guides of past generations. Small children meandered through legs and feet, meeting and playing with their own future class of river-runners well before they can form coherent memories. With stories hanging in the air and every server at Ray’s sporting a Holiday t-shirt, the intergenerational soiree has indeed kicked off! The last rapid was hard, emotional and weighty; at least that’s what Tom Beckett thought in 1973 as he squared up for Swasey’s Rapid at the end of his 3rd season of full-time guiding. This un-acclaimed rapid became his ultimate challenge, how can I take the most elegant line while taking the least amount of strokes possible; how can I, well, “go with the flow”. This was the Dee way incarnate; to make a task elegant, idiosyncratic in execution but ultimately in that impossible search for perfect synchronicity with the current. I ran Swasey’s rapid with Tom this past weekend, on the balmy afternoon before the crescendo of 200 some boat-folk and families descended upon the Holiday River Boatyard. 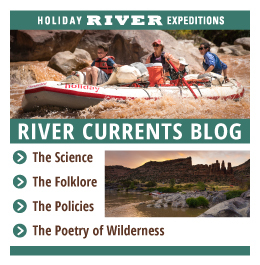 The 1st half of the day on the water was a lark; boats floating gracefully between Gray Canyon walls with no particular agenda, existing in the canyon, feeling the quick arid air evaporate river-water off our skin; listening to children’s laughter and paddles lapping the water. On my grandfather Dee’s oars, I had plied on downstream for 10 or so miles until right above the boatramp, Tom humbly asked to take the helm; he’d never liked being a passenger for this one; it meant too much to him, it was the rapid he could never convince himself to stop rowing; some 40 years later and he still found himself behind the oars of Holiday boats, Desolation and many other canyons embedded in every fiber of his being. We both realized, hanging in the calm lake above the top of the whitewater, that this was Dee’s last rapid as well… Tom took a few strokes, but not one more than was necessary; not one more than the river asked for. Untrained eyes observing the Holiday boatyard Saturday afternoon may have seen chaos incarnate; what a bird’s eye perspective may have gleaned was the fascinating methods of a highly efficient machine. Much like an ant-colony, dozens of guides unloaded, put-away, washed, and sorted hundreds of moving parts from 16 rafts in under 1 hour. Every colony needs a queen. When some systems were lost in intergenerational translation, Tim Gaylord provided clear deliberate direction, wrangling sense out of the cacophony. This hard-wired elegance built into generations of raft guides eager to get on with the celebration. Strings of lights and clotheslines of pictures framed the boat-house, mirroring the glint in the eyes of all the living history walking under the aluminum roof. Terry Taylor, one of Dee’s original boatmen took to the raft-stage and spoke of the strange motivations for us boat-people; recognizing with a wry grin it was never about the money, goodness knows there could be no way to adequately compensate folks who give the guests and the canyons every part of themselves from sun-up to sun-set. Terry reminds us why this “Job” is about so much more. 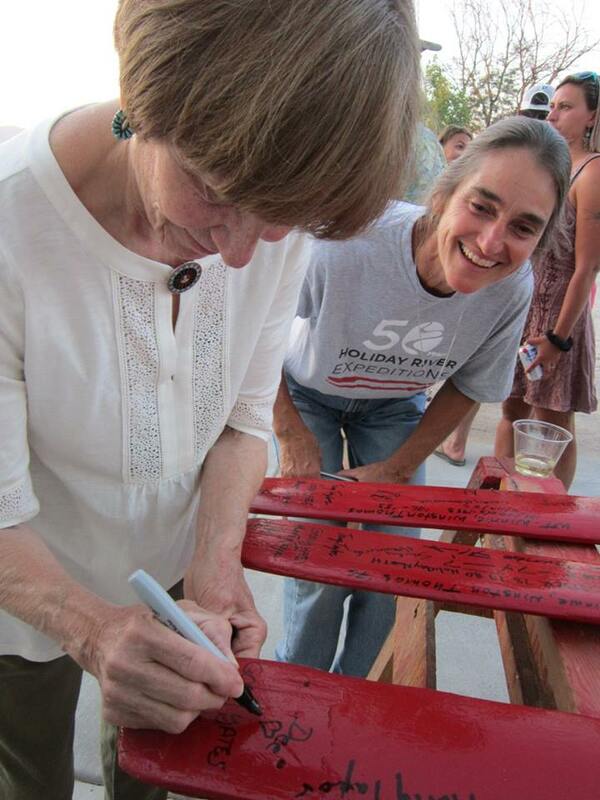 Sue Holladay makes her way over to the horse-saws lined with old wooden red oars to place her and Dee’s signature logo onto each collective-art-project; oars demarcating every generation lay available with Sharpies to leave our mark on our respective years with Holiday. 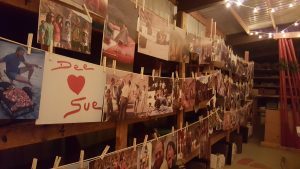 She takes patient strokes with the pen, to place the moniker “Dee ♥ Sue” on every blade, just as it is written all around their shared lives. Later into the evening after many toasts and popped corks, John Wood, Holidays owner and flame-keeper grabs the mic to call upon our heart-strings. 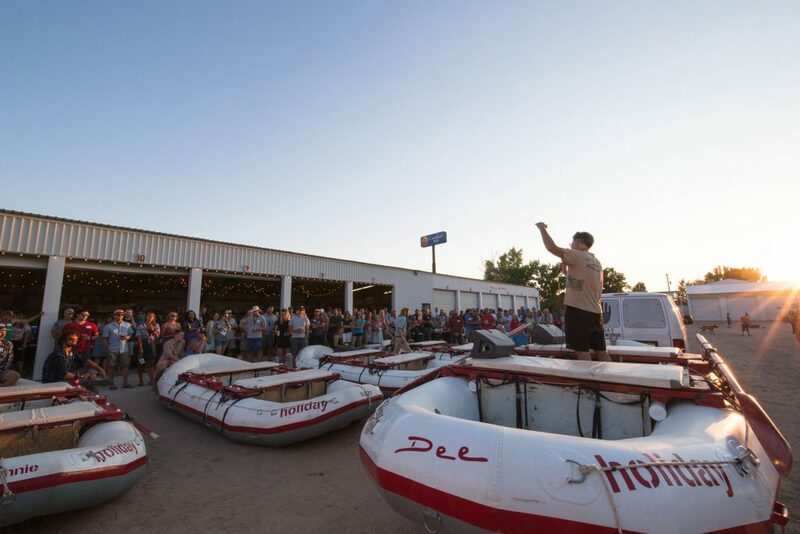 As if the whole experience wasn’t emotional enough, he recalls the ethic Dee began Holiday with, the family that was created and the legacy that lives on in the ethos each guide carries with them past their liminal tenure in this boat-yard and into the rest of their lives. Some silent tears fall to the dusty ground; many wouldn’t admit to it, but some do. We all know we’ve had the unlikely opportunity to become a part of this strange wonderful family that has impacted the deepest parts of our soul; the kind of impact that can only come from true community in wilderness, in the wildness of rivers, in the elegance of the doing of the thing. 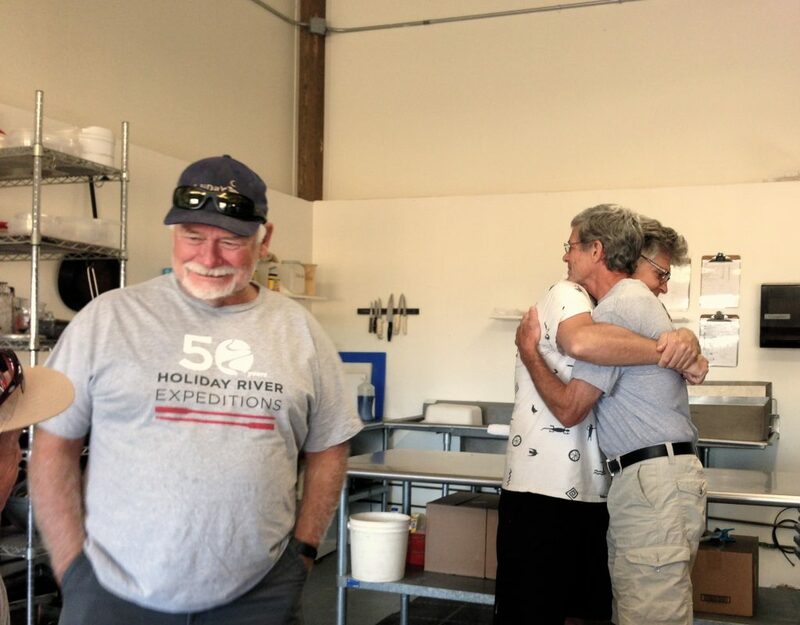 The next morning after a long late night guides wander the hallways of the quonset hut, the kitchen and the bunk-house breezeway one more time; finding old friends, saying their goodbyes, holding each other tight to savor distant friendships until the next, chance meeting. 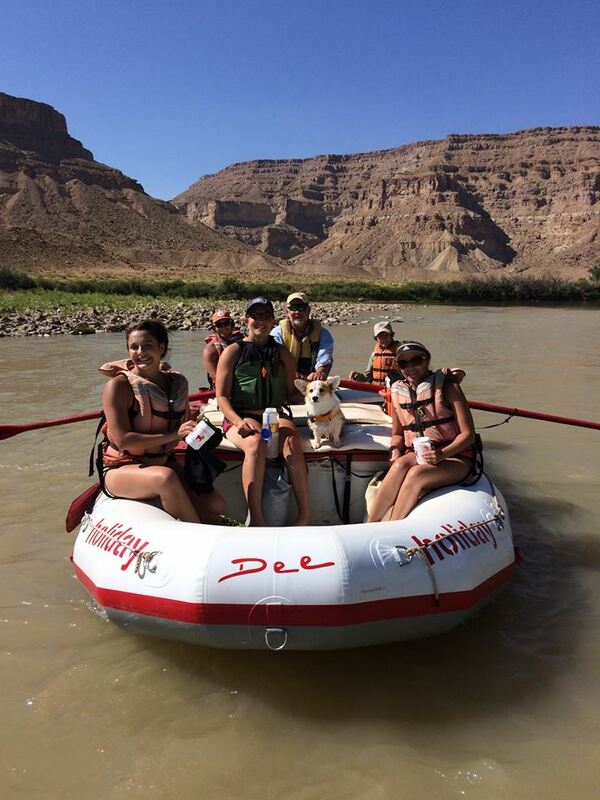 Even though there are no assurances in life, and as Dee knew someday all of us will run our last rapid, we share a knowing feeling that we will be back to run these muddy rivers again. 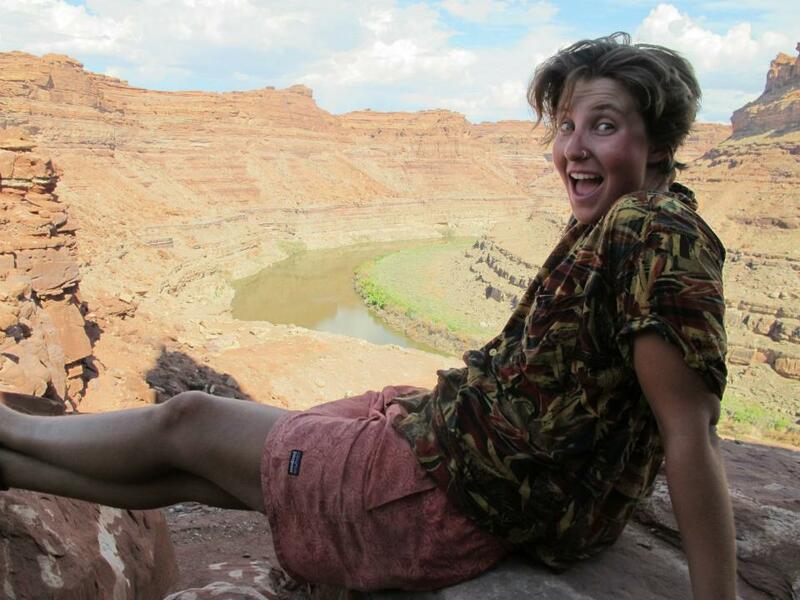 By Lauren Wood: 3rd generation river-runner with Holiday River Expeditions.